In my last post, I had talked about how much I appreciate and count on the support I get from people… Well, let me present Exhibit A! Let the Cajun education begin! A couple weeks ago, I had the pleasure of seeing several fellow Andrea Bocelli fans at an event in New York City. During the post-concert dinner, I mentioned to my Lousiana-born friend Judy that I want to develop a Cajun spice blend to add to my collection of ethnic blends. Until now, my exposure to Cajun cuisine has been limited; a trip to New Orleans several years ago, dinner at Emeril’s NOLA restaurant, and watching numerous cooking shows. Judy gave me several helpful insights, including this one that cracked me up: “Real Cajuns don’t do that blackened thing… to them, that’s not blackened, it’s just BURNT!”. 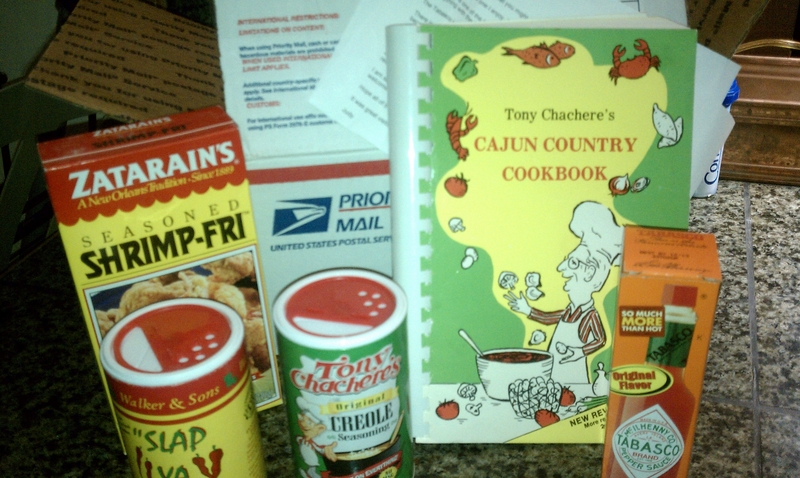 To my surprise and delight, a package from Judy arrived in the mail today, full of products that she uses and recommends, a list of “staples” for Cajun cooking, and a cookbook to inspire me! I can’t wait to dive into the world of crawfish, etoufee, gumbo, jambalaya and much more.